NAMM 2013: Peavey has rolled out the Vypyr Variable Instrument Performance series of amplifiers. The Vypyr VIP range's key feature is its ability to handle electric, acoustic or bass guitar inputs, with models available for each. 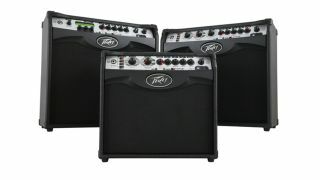 For more information, visit the official Peavey website. Music and audio innovator Peavey Electronics introduces a new generation of modeling amplifiers today with the Vypyr VIP series, the world's first Variable Instrument Performance amplifiers. After the award-winning original Peavey Vypyr series set the new standard for modeling guitar amplifiers, the Vypyr VIP series introduces an entirely new level of technological sophistication and tonal versatility. With the Vypyr VIP series, Peavey introduces the world's first amp that contains Bass guitar, Acoustic guitar and Electric guitar amplifier models. With Peavey's Variable Instrument Input, a single amp can provide amplification for a variety of instrument types. Not only does the amplifier morph from a bass amp, to an acoustic amp, to an electric amp, it also allows the electric guitar player access to instrument models as well -- another Peavey first! The Vypyr VIP's astonishingly realistic instrument simulations allow users to manipulate the sound of their electric guitar to mimic an acoustic guitar, a bass, a 12-string guitar, and more. Peavey uses a combination of powerful 32-bit, floating-point SHARC processors and patented TransTube analog circuitry to create the best sounding modeling amplifiers available. Thanks to the Vypyr VIP's new acoustically ported semi-closed back enclosures, each model sounds both full and "present". Guitarists have access to over 50 amp, instrument and stompbox models as well as rack style effects, enabling endless options for creativity and a whole new range of tonal possibilities. While the Vypyr VIP series is packed with an array of features, Peavey's WYSIWYG (What You See Is What You Get) interface enables users to easily view all of the parameters at a glance, without the need scroll through menus or to plug into a computer or external device. Vypyr's new USB bi-directional data and audio port provides an easy way for users to connect to a computer and record, access the Vypyr Edit software and store presets, get lessons, and practice to backing tracks. The Vypyr series also includes a MIDI port for use with Sanpera foot controllers and firmware updates.